You won't miss the meat in this vegetarian and gluten free hazlenut and cremini loaf, packed with flavor from sauteed veggies, herbs and a rich vegan gravy. 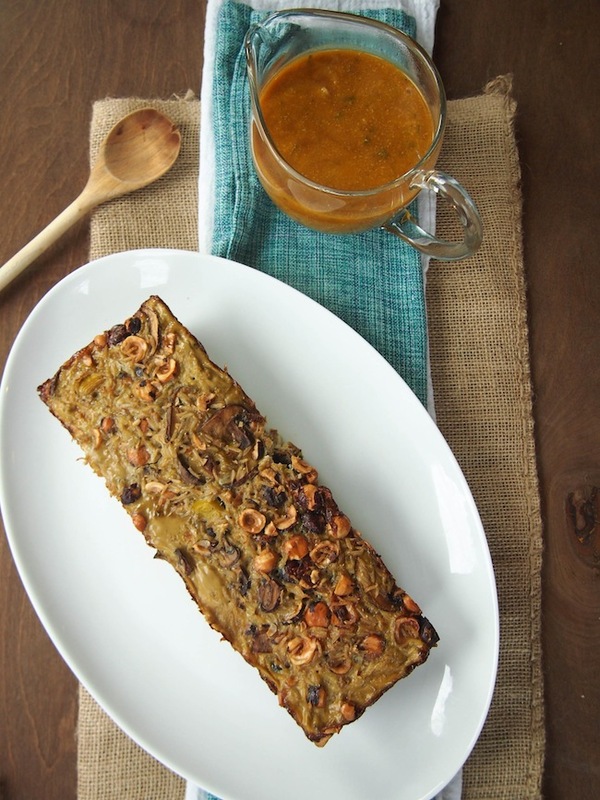 This vegetarian hazelnut and cremini loaf is the kind of vegetarian comfort food I love! 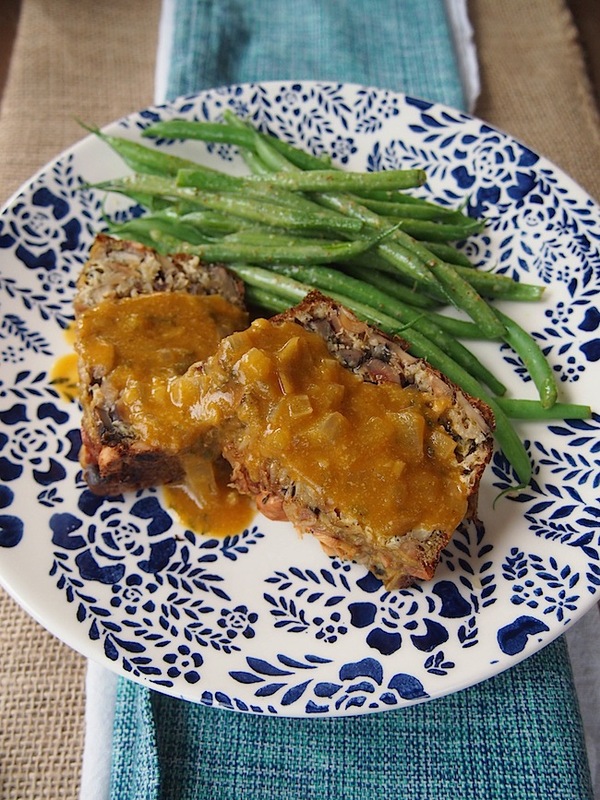 If you like meatloaves, you'll love this version made from grains and nutty hazelnuts. It kinda tastes like Thanksgiving stuffing to me, but in loaf form. If I were you, I might serve this as a vegetarian main on Thanksgiving if you're meatless. We served this with blanched green beans tossed with a lemon - dijon dressing sweetened with a bit of honey. Adapted from Green Kitchen Stories. Preheat oven to 400 degrees. Spray a large loaf pan with olive oil or line with parchment paper. Heat olive oil in a large saute pan on medium heat. Add the mushrooms, leeks, and garlic. Stir. Add thyme, rosemary, salt and pepper. Cook about 10 minutes, stirring every so often, until the mushrooms have released and reabsorbed their liquid. Remove from heat and let cool about 10 minutes. Mix eggs, milk, nutmeg, zest, salt and pepper together in a bowl. Stir in brown rice. Stir in the cooked nut and vegetable mixture. Pour this mixture into the loaf pan and bake about 45 minutes. Once cooked through, remove loaf from the oven and let cool about 10-15 minutes before slicing. Since the loaf is chunky, cut it into thick slices, otherwise it will fall apart. While loaf is baking, make the gravy. Heat olive oil in a small pot on medium-high heat. Add onion and saute until translucent. Add flour and stir to coat. Cook a couple minutes to take the raw edge off. Add soy sauce and stir to deglaze. Slowly pour in broth while whisking. Continue to whisk away all the clumps. Stir in nutritional yeast. Cook until thickened, 5-10 minutes. Season with salt and pepper.